The yarn is true to its name – a thousand colours are united here, to make each ball unique. 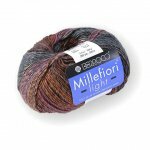 Spun with fashionable metallic thread, this yarn acquires a touch of glamour. With its unique colourways it is perfect for all sorts of accessories, especially for crocheting and knitting shawls. 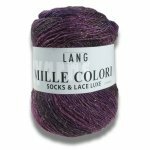 The composition and running length make Mille Colori Socks & Lace a classic sock yarn.